A few European corn borer (ECB) adults have been captured in the southwestern part of the state through Burlington County over the past week (see ECB map). At this point numbers are low. As warmer weather becomes consistent, catches should increase across the state. Night time temperatures in the low 50°F range or lower will cause catches to develop more slowly. Larval infestations should not occur for some time yet. We will first see a significant increase in the number of traps registering catches. No corn earworm moths (CEW) have been captured in blacklight traps in New Jersey as of this time. Black cutworm (BCW) moths are also flying. These are the moths that will produce the seasonal first generation caterpillars that will be attacking corn plants and other crops. BCW larvae normally feed on plant stems and roots below ground level, and are more of a problem in minimum tillage fields. Soil disruption inhibits BCW development in the field. With recent (and forecast) wet weather, garden slug injury has begun to appear in seedling stage sweet corn plantings. This damage appears as irregular holes (not neat, circular holes) within the margins of leaves. Often, the dried slime-trail of the slug is noticeable. Garden slugs may be found underneath small soil clods or debris. Generally, this is not a pest that requires management. Drier weather will limit their mobility, and cultivation disrupts them in the field. Warm weather permits rapid plant growth, outpacing slug injury. Egg laying by imported cabbage butterflies (ICW) is occurring at this time, and will continue as warm weather permits activity. Infestations of this pest have not been seen by scouts in the northern counties as yet, but are likely present in southern parts of the state. Scout plantings weekly. Check 5 consecutive plants each in 10 random locations throughout the planting, paying particular attention to the innermost leaves where ICW often feed. Consider treating if caterpillars are found on 10% or more plants that are in the 0-9 true leaf stage. From 9-leaf to the early head stage (in broccoli, cauliflower and cabbage) infestations up to 20% may be tolerated. Once heads begin to form, a 5% threshold should be observed to protect the marketable portion of the plant. For leafy greens such as collards and kale, 10% plants infested is the threshold throughout. Insecticides based on the soil inhabiting bacterium Bacilllus thuriengensis (B.t.) may also be effective on caterpillar pests of cole crops. Examples include Xentari and Javelin. If B.t. materials are used, they must target smaller larvae. Do not wait until large larvae are dominant the field, as results may be unsatisfactory. An added benefit of all the aforementioned chemicals is that they have minimal impact on non-target species, including many insect predators and parasites. Spinosad materials should be used in a way that avoids contact with bees. Crucifer flea beetle is active on many plantings, particularly when conditions are warm. When scouting cole crops for caterpillar pests, check for the presence of flea beetles. Consider treating if flea beetles are present on 50% or more plants, and feeding injury is evident on the plants. Be sure to monitor newly emerged or transplanted fields for the presence of this pest. In general, plants like arugula and mustard (those with a “hotter” flavor) are more favorable to flea beetles. Transplants may benefit from a soil application of a neo-nicotinoid insecticide. Labeled materials include imidacloprid (Admire), thiamethoxam (Actara) and clothianodin (Belay). These materials, when used at planting, will provide protection from flea beetles during the period of time it takes them to establish and put on vigorous growth. Several individual BMSB adults were captured in blacklight traps this past week. These catches occurred in Port Colden (Warren County), and in Denville and Chester (Morris County). As adult captures increase, maps will be produced to show where activity is highest. Information on scouting, crop injury and control will also be included. 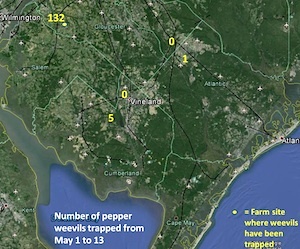 Large numbers of weevils are being caught near a produce handling facility in Gloucester County (see Pepper Weevil Trap Catch Map). 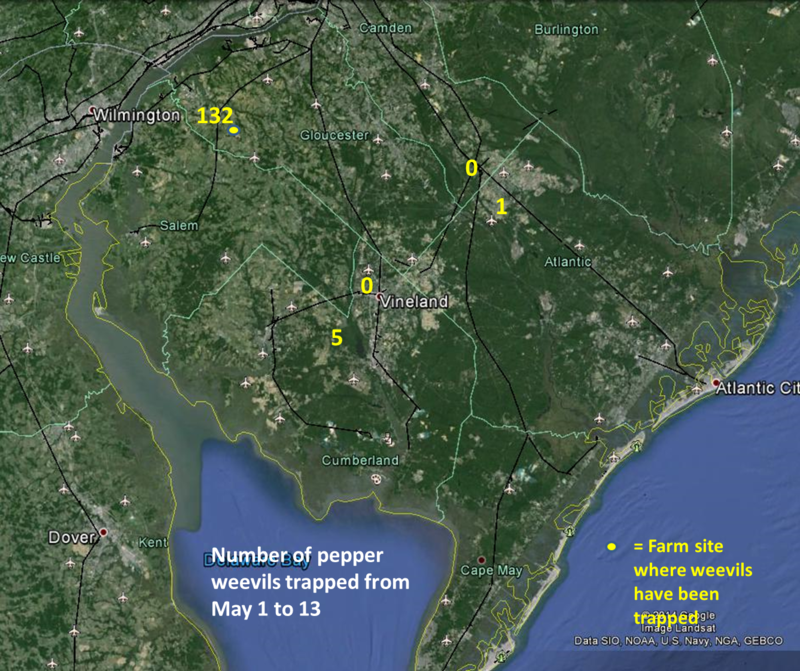 Pepper growers in the immediate area must be watchful for field infestations as soon as flowers or fruit appear.